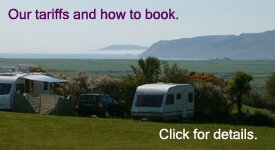 The closest camping and touring park to the village of Abersoch. Tyn y Mur Touring and Camping Park is the closest campsite to Abersoch in North Wales and is a superb family and couples only touring caravan and camping park. Situated on the hill overlooking Abersoch Bay, Hell’s Mouth and the mountains of Snowdonia (which frame Cardigan Bay), the panoramic views are truly breathtaking. Tyn-y-Mur camping park overlooks the popular seaside village of Abersoch and as well as the surfer’s favourite, Hell’s Mouth. Visitors to the campsite really appreciate the quality, clean, well maintained services, including shower and toilet block, and washing up and laundry facilities which are regularly cleaned and maintained. There is WiFi throughout the park. The children’s play area and football pitch provide constant entertainment for the young ones…and a great way to make new friends. 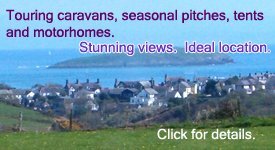 If you’re looking for a caravan site in Abersoch, come to Tyn y Mur and enjoy the stunning views, fantastic facilities, excellent service and ideal location. Tyn y Mur is the closest touring caravan and camping park to the village of Abersoch and a firm favourite with families, many of which, we are delighted to say, return year after year. Our resident wardens give all our visitors a friendly welcome and work hard to make sure you have a fantastic holiday at Tyn Y Mur. They hope to see you soon. The Park re-opens on 22nd March 2019. We provide our guests with the best facilities to ensure their stay with us is as safe and comfortable as possible. As well as clean, regularly serviced toilets and showers (with FREE hot water), we have a washing up room and laundrette facilities. The campsite also features an adventure play area and a football field to keep the children entertained. Tyn-Y-Mur is surrounded by farmland with panoramic seaviews and is the ideal location for the perfect family camping holiday whether in a tent, caravan or motorhome. 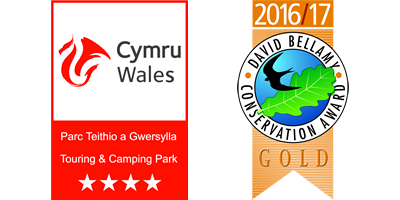 We offer pitches for touring caravans, motorhomes and tents as well as seasonal pitches. Organisations, groups, clubs, etc can be accommodated by prior arrangement. 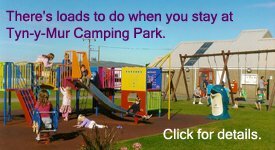 Click here for details of our rates, availability, Conditions for Campers and online booking form. If you would like to make a reservation, or enquiry, please use our online booking system or email us on: info@tyn-y-mur.co.uk.